On November 17, Deputy Under Secretary of Commerce for Intellectual Property and Deputy Director of the United States Patent and Trademark Office (USPTO) Michelle K. Lee welcomed 35 young inventors to the USPTO headquarters for the 2014 Collegiate Inventors Competition (CIC). Introduced in 1990 and co-sponsored by the USPTO, Invent Now, and the AbbVie Foundation, the CIC recognizes the nation’s most innovative undergraduate and graduate students working on cutting-edge inventions at their colleges and universities. 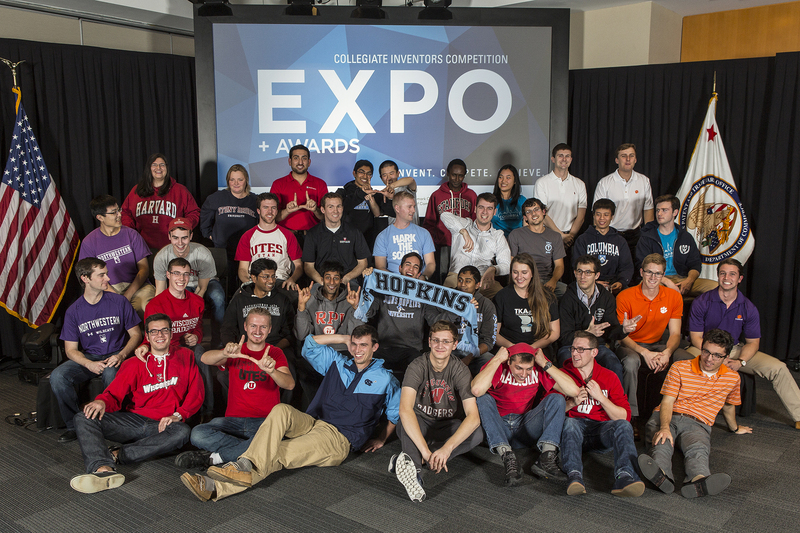 Competition finalists showcased their inventions and interacted with thousands of USPTO patent and trademark examiners, sponsors, media, and the public at the Competition Expo, bringing together innovative minds from across the country. The finalists received feedback from a judging panel of influential inventors and experts, comprised of eleven National Inventors Hall of Fame Inductees, representatives from the USPTO, and AbbVie scientists. The top three entries in each division were awarded cash prizes including $15,000 for the graduate first place invention and $12,500 for the undergraduate first place invention. The winner in the graduate category was Katarzyna M. Sawicka from SUNA Stony Brook University for the Immuno-Matrix, a skin patch that delivers a vaccine as easily and painlessly as putting on a Band-Aid®. The winners in the undergraduate category were Taylor Fahey, Charles Haider, and Cedric Kovacs-Johnson from University of Wisconsin – Madison for Spectrom, a device that prints low-cost, high-precision, on-demand full color 3D printing. Read more about the winners. With an eye toward the future and a focus on protecting their groundbreaking work, more than half of the 35 young inventors have filed provisional patent applications. In fact, five of the finalists have already launched startups in an effort to bring their inventions to market. Read more about the 2014 CIC finalists and winners.